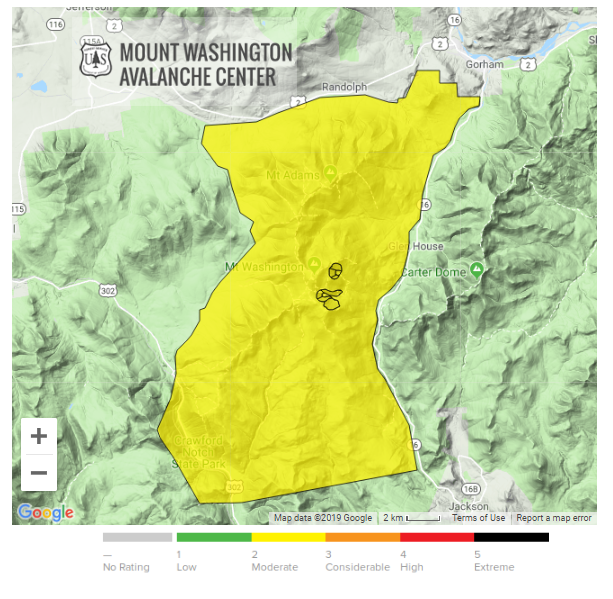 The avalanche forecast for April 12, 2019: Mount Washington Avalanche Center. Authorities warn that the possibility of further avalanches is increasing a day after a skier died on Mount Washington. A spokesman for the White Mountain National Forest says a man skiing alone in an area called Raymond Cataract was buried under about 5 feet of snow for about an hour Thursday afternoon before rescuers dug him out. The man was pronounced dead several hours later. At 6,288 feet elevation, Mount Washington is the highest peak in the Northeast and is notorious for its bad weather. With 9 inches of new snow and strong winds expected throughout the day, the Snow Rangers at the Mount Washington Avalanche Center have raised the avalanche threat level to "Considerable" across the Presidential Range and "High" in places like Tuckerman Ravine. "Human-triggered avalanches are likely,” the forecast reads, “and will be large enough to bury and kill a person on open slopes and gullies." As NHPR’s Sean Hurley discovered during a recent visit to Mount Washington, the Snow Rangers don’t mess around - and they don't want you to either. This weekend, two Canadians in Tuckerman Ravine triggered an avalanche, which swept them and two others 500 feet down to the bottom of the bowl. None of those affected suffered serious injuries, but it highlights a growing trend in the White Mountains: more skiers getting themselves into avalanche terrain earlier in the year.